It wasn’t until today that I knew which film I was going to review for this week’s trailer rewind. When the internet exploded to reveal the cast for Star Wars: Episode VII, I knew that there was only one film that I needed to share with you. If you stepped foot inside a movie theater anytime during the last quarter of the 20th century, you are familiar with Drew Struzan’s work. 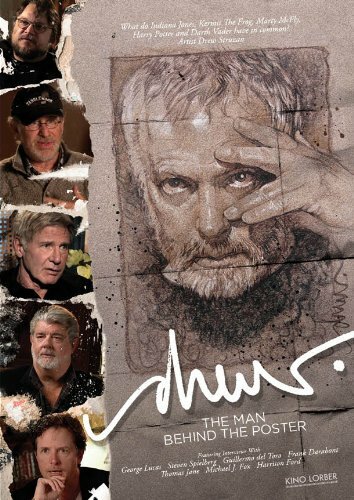 Drew: The Man Behind The Poster takes us through Struzan’s career from low-paid designer of album covers, his transition to film posters, to his retirement in 2008. This film balances Struzan’s story with excerpts from interviews with actors and directors discussing and praising Struzan’s work. Its refreshing to see Spielberg, Lucas, Darabont, and del Toro talk about Struzan’s work with a combination of professional respect mixed with the giddiness of a kid in a candy shop. Other treasures include discussions with Struzan himself regarding his distinctive style and insightful anecdotes about particular posters. Unfortunately this film serves as a reminder of the rapid decline in the quality of film posters over the past decade. What was the last iconic film poster you can think of? What recent poster captured the essence of the film in such a way that you were eager to hang that poster on your wall? If you love film, chances are you already love Struzan’s work. This week take some time to sit down and allow yourself to be immersed in the art and craft of a true master.